CEF volunteers are visiting schools throughout the week to discuss engineering careers and taking part in other engineering-related events in Chicago. CEF is partnering with the Society of Women Engineers, and Union League Club of Chicago for a reception, Celebrating Engineering in Chicago on February 21st, and volunteers will participate in “Ask the Engineer” activities at the Chicago Architecture Center’s Engineering Fest. 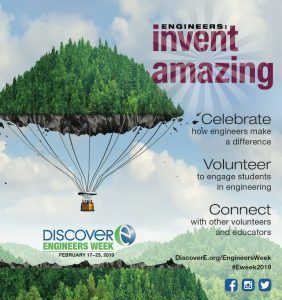 Founded by NSPE in 1951, EWeek (February 17–23, 2019) is dedicated to ensuring a diverse and well-educated future engineering workforce by increasing understanding of and interest in engineering and technology careers. Today, EWeek is a formal coalition of more than 70 engineering, education, and cultural societies, and more than 50 corporations and government agencies. Each year, EWeek reaches thousands of schools, businesses, and community groups across the U.S.